Tis the season, once again...got up into the 70s, yesterday! 3 sales, struck on 2, but the Rummage Sale had a few items.. So, what is so interesting in this $2.25 pair of tools? Screwdriver seems to be an older Stanley, with a square shank in a fluted wood handle..
Been well used ( or abused ). That be a hole into the ball end...hammer needs a wedge yet, and the clean up/rehab will be done..
Nice tools. Is that a deep dent or a hole in the hammer? You have to wonder why. Could it be brazed and filed back to shape? (04-14-2019, 01:34 PM)Phil S. Wrote: You have to wonder why. Could it be brazed and filed back to shape? Could it be some sort of custom hammer that should have a hole in it? That hole just doesn't look like it got there accidentally. Otherwise I would use hard welding rod in a stick welder to fill it in with the hammer face (other end of the head) submerged in water. Braze is way too soft. The hold in the hammer could have been a defect in the casting (if the head were cast brass). I like old vintage hammers. So many custom sizes and uses. and if they were well-taken care of, the patina on the handles just can't be matched. (04-14-2019, 06:07 PM)AHill Wrote: The hold in the hammer could have been a defect in the casting (if the head were cast brass). I like old vintage hammers. So many custom sizes and uses. and if they were well-taken care of, the patina on the handles just can't be matched. 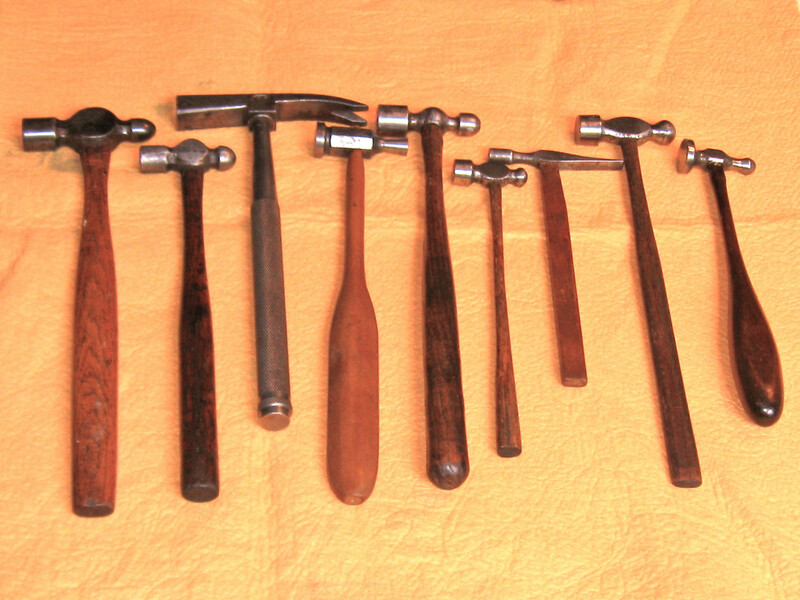 I like hammers and have a couple dozen or so...I guess I am a collector, particularly of small hammers, and I also love the patina that only age can create..I am also a hammer "maker"....I made the jeweler's hammer on the right about 40yrs ago..I used a 3/4" grade eight bolt and an old Atlas metal lathe..I agree with Alan that the "hole" could just be a flaw in the casting. But I'm not sure why anyone would "need" a brass Ball Pein, since the softer brass would be quickly "deformed" in use..unless the "brass" is actually Beryllium copper.